1. Heat the oven to 180˚C, gas mark 4. In a small sauce pan, melt the butter. Add the shallots, garlic and thyme, sweat for 3 mins. Add the prunes and whisky, then add the milk and cream and season. 2. To the pan, add the sliced turnips and mix together well to evenly coat all the turnip. 3. 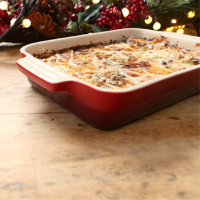 Pour the turnip mixture into a buttered baking dish, scatter the Gruyère over, cover the dish with tinfoil and bake for 30 minutes. Remove the foil and bake for a further 15 minutes until the bake is brown and bubbling on top with tender creamy turnips within. This recipe was first published in Fri Nov 22 16:56:00 GMT 2013.